George Booth was a connoisseur. 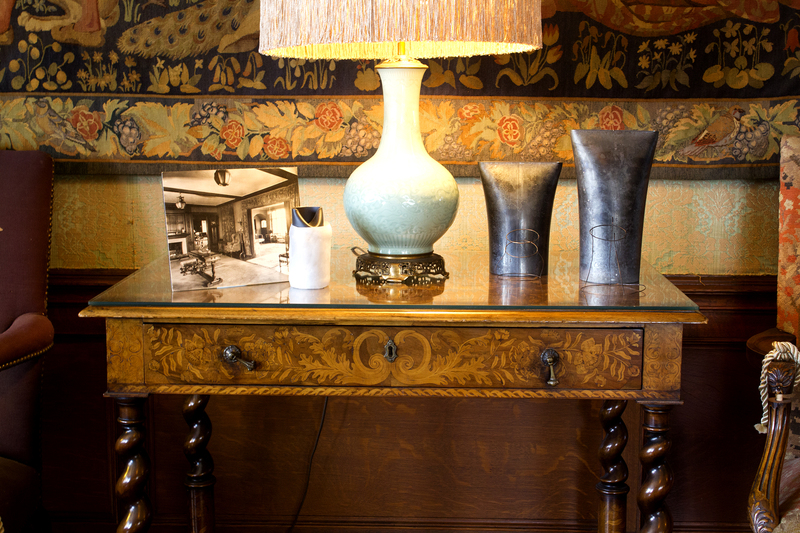 As an avid collector of beautiful objects, he acquired decorative and fine art to adorn his home, Cranbrook House (and later, the various Cranbrook institutions). One of the most collected categories: metal objects. He was, after all, descended from a line of copper and tinsmiths. 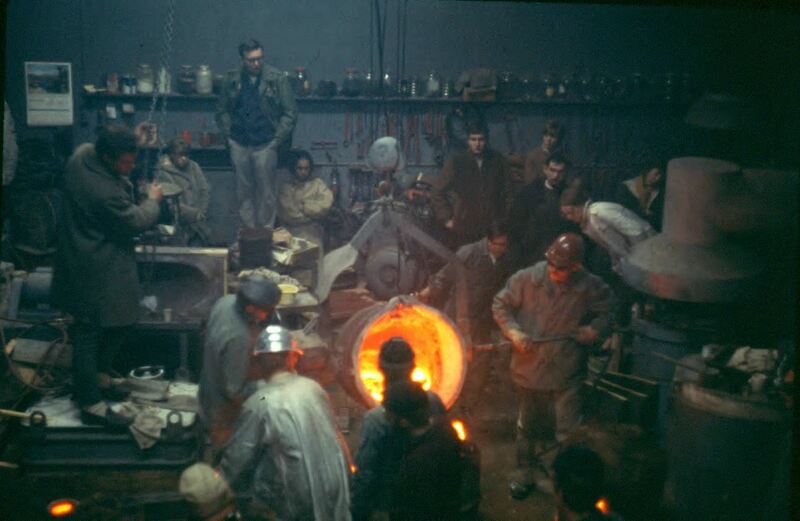 At fifteen, George Booth started a two-year apprenticeship at the Red Foundry in St. Thomas, Ontario, where he learned the fundamentals of the millwright and blacksmithing trades. He expanded his interest in craftsmanship through investment into an ornamental ironworks firm in Windsor (Evans and Booth) soon thereafter. 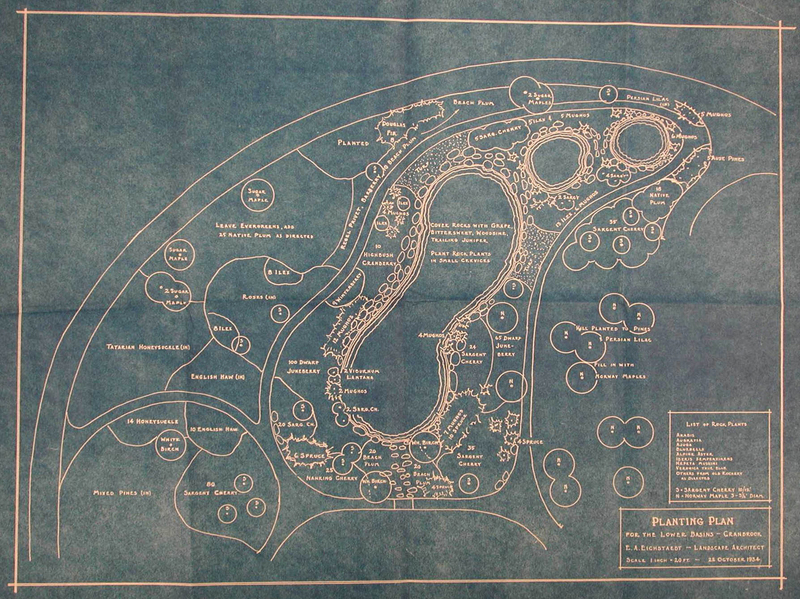 While he sold his share of the iron business in 1888, Booth continued sketching designs for metal products throughout his life. They’re collected in his sketchbooks . 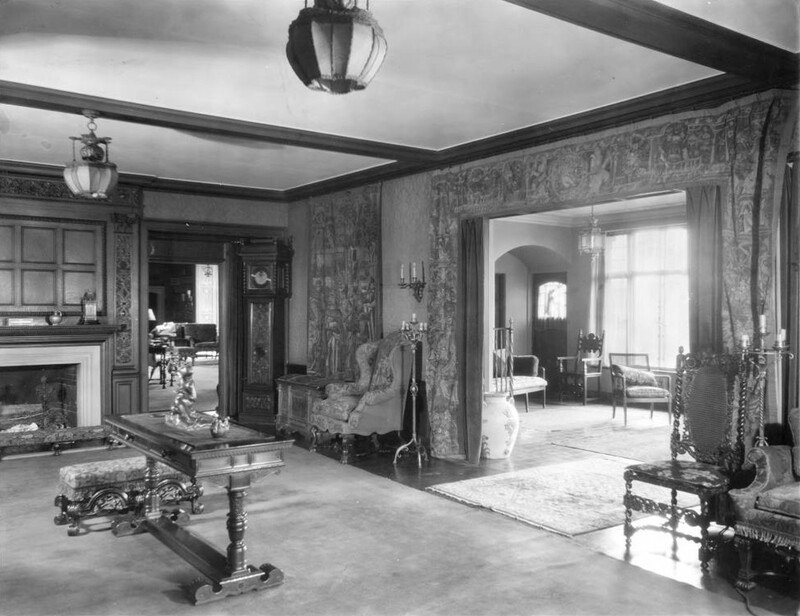 Some of his sketches for gates, furniture, and decorative elements were realized by Samuel Yellin of Philadelphia, while others were completed by local forges, and some simply ideas. 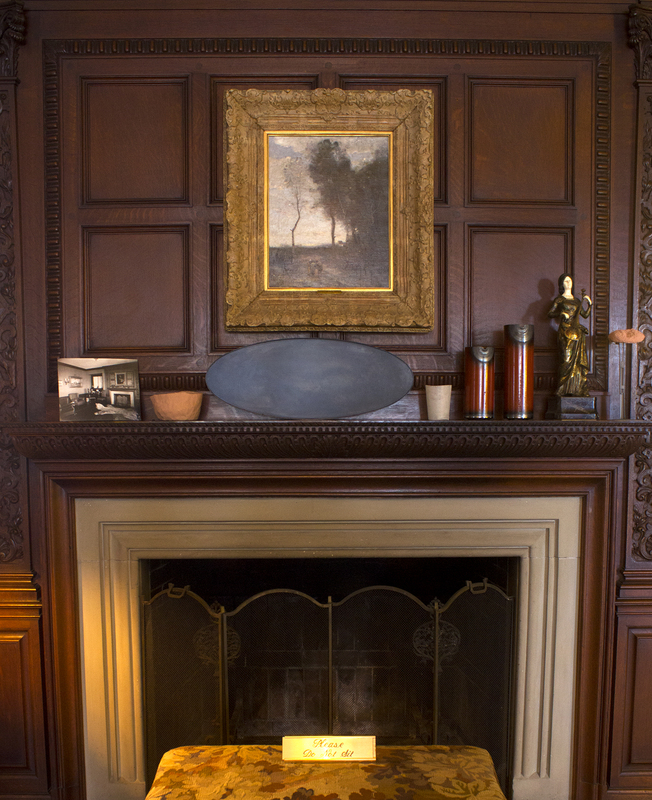 If you look at enough images of the house, you will realize Booth was constantly rearranging his collection. 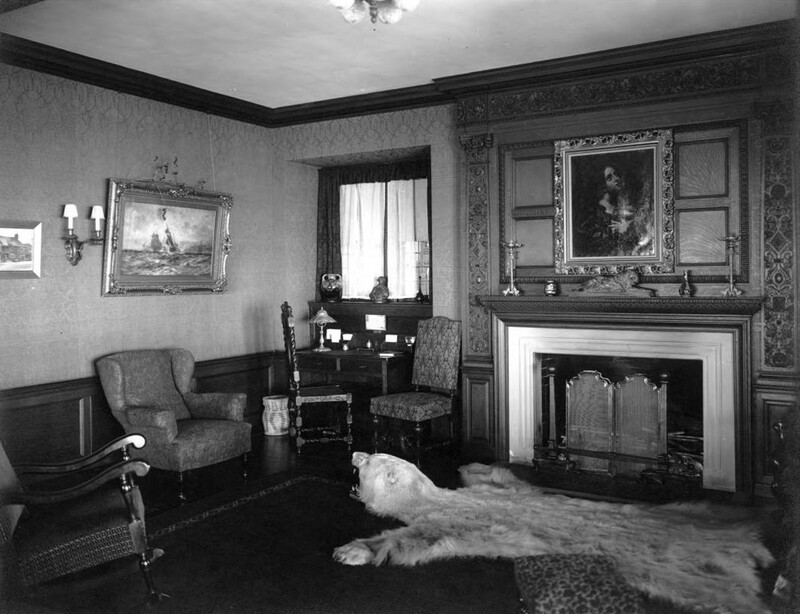 Here, Eli Harvey’s 1904 work Recumbent Lioness is on the mantelpiece. 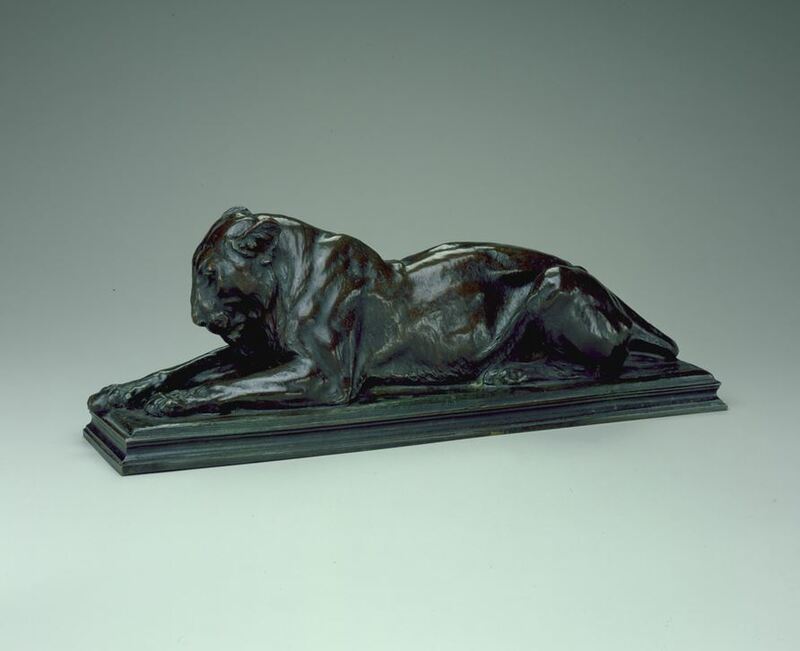 Starting in 1915, Booth loaned decorative and fine artworks to the Detroit Institute of Arts, including many bronzes previously on display in his home. In 1919, he gifted ninety-six of these objects (in iron, ceramics, wood, silver, and bronze) to the DIA, where many are still on view. You can flip through the DIA’s 1919 Bulletin describing Booth’s gift (in text and images). 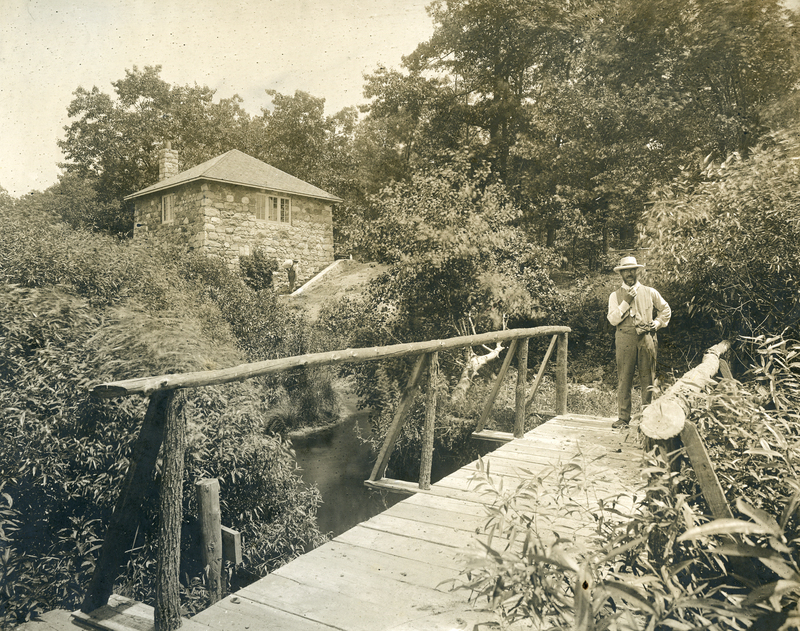 Once Booth began developing the Cranbrook campus, he spent less energy collecting for Cranbrook House. However, the house has on occasion welcomed contemporary design, like the 1950 competition for Cranbrook Academy of Art students for the design of Packard automobiles and hood ornaments. Cranbrook Academy of Art students admiring designs for the Packard Motor Competition on display in the Cranbrook House Library, December 1950. Harvey Croze, Photographer. 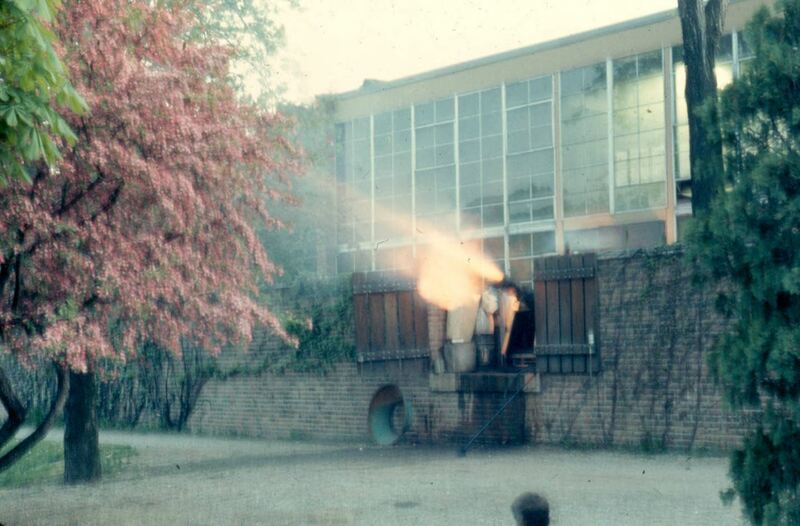 Courtesy of Cranbrook Archives. Next week, students and alumni of the Academy’s Metalsmithing department will be gathering in Cranbrook House to show their work in the context of the Booth home in an exhibition organized by current students, A Line of Beauty: Cranbrook House Inhabitation. Taking their work out of the typical museum gallery setting (and off of the usual white pedestal) will provide a new framework in which to understand and view their pieces, and will also be a continuation of what George Booth did in his own lifetime: bring new art into the home to be placed among other items of beauty. What I look forward to in the pop-up exhibition with the Metalsmithing department is not only the opportunity to see work from students and alumni, but also to view the many objects already in the house in a new light. Montgomery recommends looking at objects with half-closed eyes and from various angles, and next Friday night, I plan to do the same. 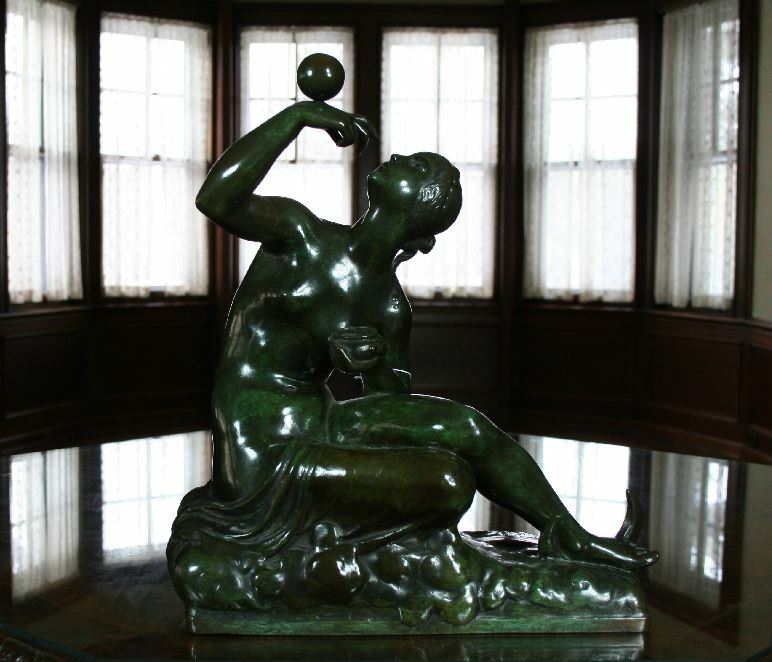 A Line of Beauty: Cranbrook House Inhabitation will take place Friday, January 26th from 5:30 to 8:30pm. The presentation is curated and organized by the Cranbrook Academy of Art Metalsmithing Department, and is presented at Cranbrook House through the Cranbrook Center for Collections and Research. All are welcome. Editor’s Note: New works shown are by Adam Shirley, Alberte Tranberg, Natalia Sarrazin, and Iris Eichenberg. Over the past few years, I have listened to researchers in the Archives and visitors to the museum describe works of art as divine or heavenly, but I don’t remember those words used to describe the artist. Until now. 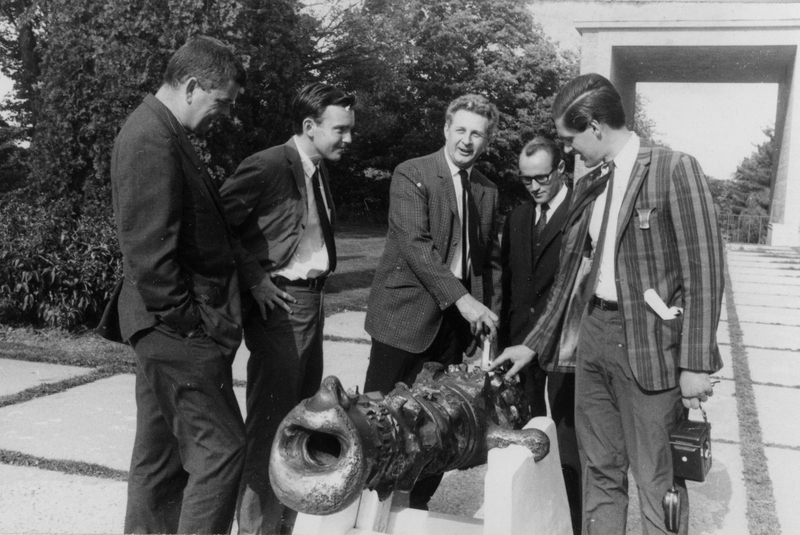 Did you know that during the 1950s-1960s there were several artists who studied at the Academy of Art who were also members of a divine order? Admittedly, I have not had much interaction with nuns in my lifetime, but I have a keen fascination (cue: “The hills are alive with the sound of music..”). Sister Mary James Ann Walsh, BVM (Order of the Blessed Virgin Mary) was one of several nuns to study at the Academy where she received her MFA in painting in 1955. In 1953, Sister Mary was the First Prize Winner of the 9th Annual Iowa Water Color Show for her piece, “Ecce Homo.” That painting is now part of the Sioux City Art Center’s permanent collection. In addition to her Cranbrook degree, Sister Mary studied at the State University of Iowa and the University of Colorado. In 1959 she became head of the Clark College department of Art in Dubuque, Iowa. Sisters at work in the metal shop, 1954. 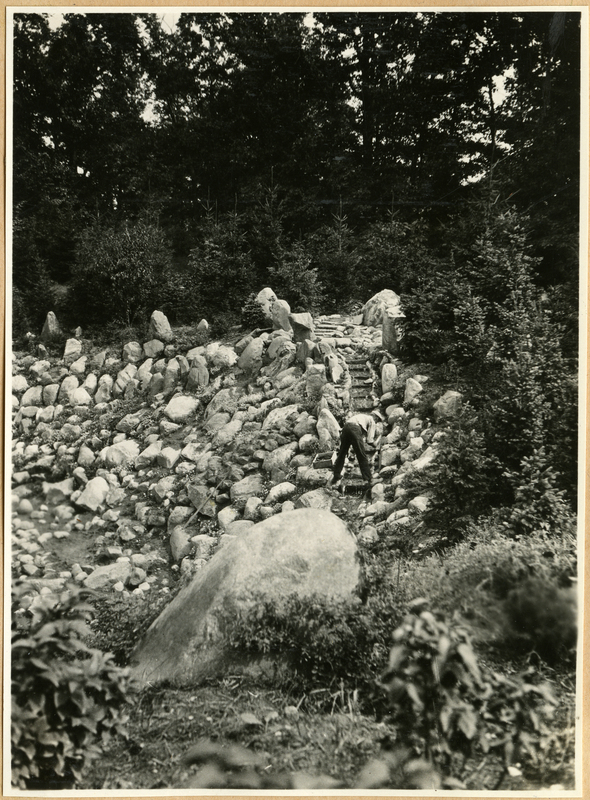 Courtesy Cranbrook Archives. 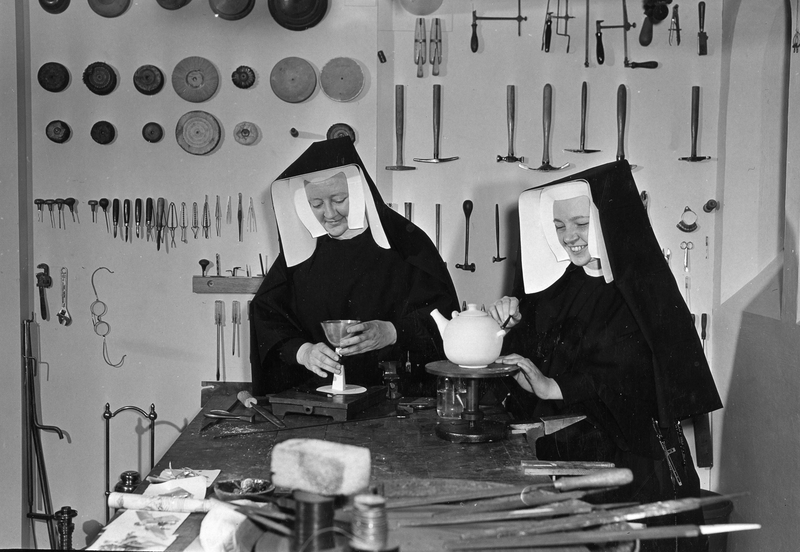 The photo above shows Sister Mary Grace Esther Mehren, BVM, and Sister Mary Barbara Cerny at work in the metal shop in 1954. We are still looking for information about Sister Mary Barbara, but according to the Chicago Tribune (15 Jun 1958), Sister Mary Grace Esther was appointed to oversee construction of an eleven-story Scholasticate on the campus of Mundelein College. The building houses lecture halls, classrooms, a dining hall, and a chapel. Another CAA alum (Metalsmithing ’49), Sister Helene O’Connor, O.P. (Dominican Order of Preachers), founded Studio Angelico in 1935, at Siena Heights University in Adrian, Michigan. Studio Angelico, the art department at Siena Heights, was named for the 15th century Dominican painter, Fra Angelico. 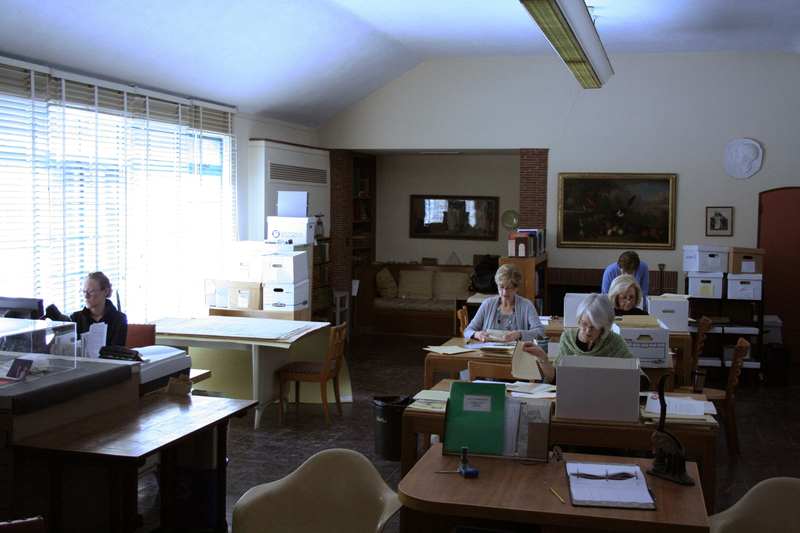 Sister Helene chaired the art department, taught classes, and directed community workshops. An accomplished sculptor, ceramicist, weaver, and muralist – her work has been exhibited at the Portland Museum of Art, the Detroit Institute of Arts and the Metropolitan Museum of Art. Sister Marie Gertrude’s, “Mother Hen,” Bay City Times, 27 Sep 1964. Also of the Dominican order, Sister Marie Gertrude Lohman, O.P., received her MFA in Sculpture from the Academy in 1966. Several of Sister Marie Gertrude’s sculptures display in Illinois, including a statue of St. Catherine of Siena at the Queen of Heaven Cemetery in Chicago and a statue of St. Albert the Great in the student courtyard at St. Rose Priory. Sister Marie Gertrude studied in Schifanoia, Italy, and her work has been exhibited in Chicago and Dubuque. 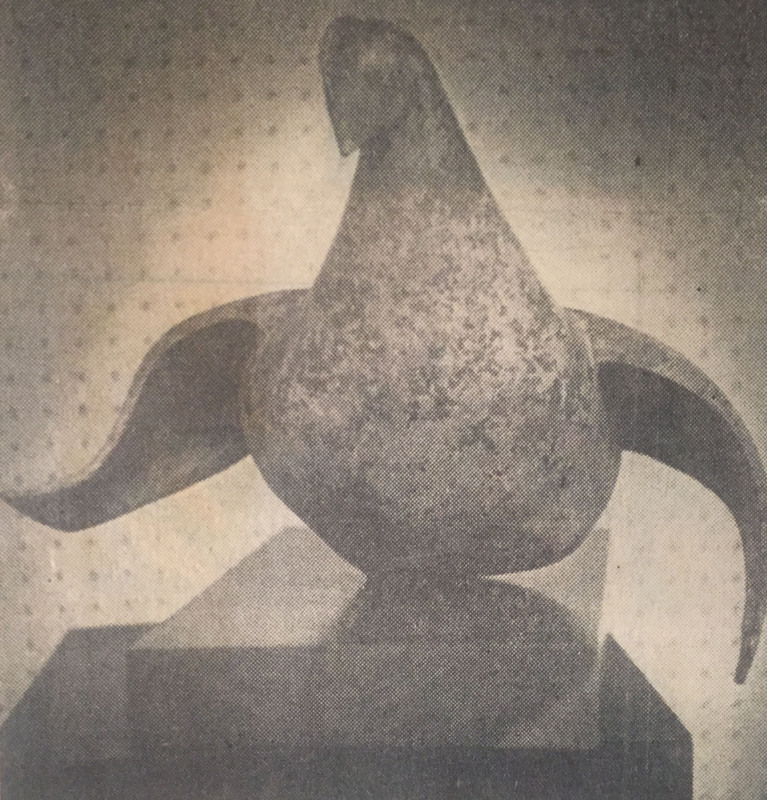 In 1964, her work, “Mother Hen,” was displayed at the Studio 23 space at the Arts Center in Bay City, MI. This research has only deepened my fascination of the divine sisterhood. I wonder what drew the sisters to Cranbrook? 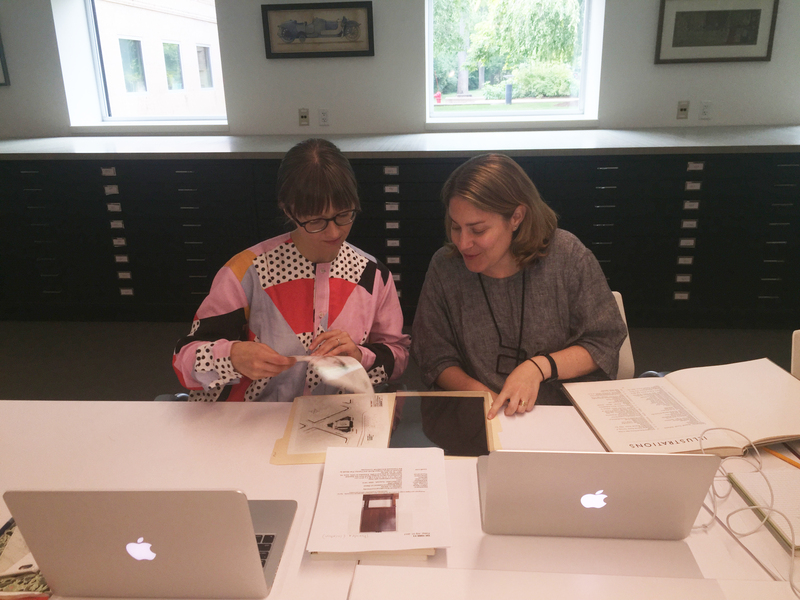 There were several other nun-students at CAA – I look forward to learning more about their contributions to Cranbrook and the art world.